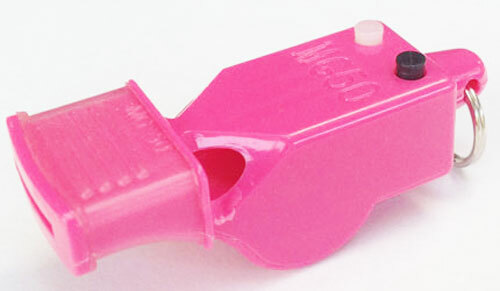 This MG50 whistle is an easy to use, all in one Possession Control Whistle with a Anti-Microbial Mouthpiece. A patented whistle that uses two raised "snap & click" buttons that are at eye level and color coded for the home and away teams. These buttons give the official a clear view of which team has possession therefore eliminating any confusion for the next possession call. October is usually Breast Cancer Awareness Month. A Pink Ribbon brings awareness to Breast Cancer. This whistle was designed with that in mind. To symbolize strength for breast cancer survivors and their family and friends. This whistle is also available in Black and White. For orders of 25 whistles or more, please email us for a quote.